Hampshire has a rich history, much of it centred on Winchester which was once the capital city of England. With so much history in the area, it is little wonder that the county has plenty of haunted spots. 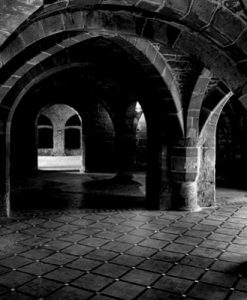 Let’s meet the Hampshire ghosts that haunt some of the area’s most iconic buildings. 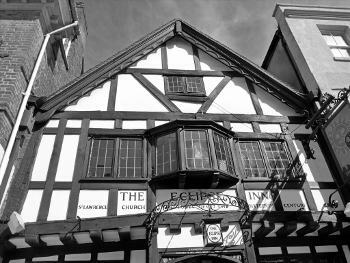 The Eclipse Inn in Winchester has been around since 1540 and over the years has seen many uses including a rectory, a private residence, an ale house and from the nineteenth century onwards it has been an inn. It is also reputed to be very haunted. The most common reports of paranormal activity involve the grey lady. This is alleged to be the spirit of Dame Alice Lisle a woman who was executed in 1685 in Winchester Market Place for harbouring traitors during the Monmouth Rebellion. Alice spent her last evening alive in the upper story room of The Eclipse Inn and it seems like she is now destined to spend her afterlife there too. 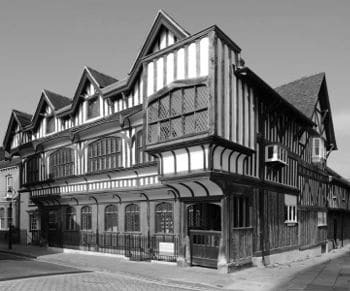 The Medieval Merchant’s House aka 58 French Street in Southampton, is one of the earliest surviving houses in England. It is said to date back to the tail end of the thirteenth century and even the fact that it remains standing is something of a miracle. It sustained massive amounts of damage in the sack of Southampton in 1338 and again during the blitz of 1940 despite neighbouring properties being completely destroyed it remained standing- almost as though someone or something is protecting it! The building was built as a home for wine merchant John Fortin and his family, but over the years it has been divided up into apartments, opened back up into a single house, used as a lodging house and even became a pub for a time in the nineteenth century. In fact, back when it was The Bull’s Head Inn, mischievous spirits would reportedly blow out candles and the owners would often awake to find a woman in a dirty dress standing at the end of the bed! Later, during the second world war, the house became a brothel and a sailor is said to have murdered one of the girls in a dispute over her payment. Today, the ghostly figure of a woman is seen in one of the bedrooms and she often drifts through a long since bricked up doorway. Other common reports include footsteps on the wooden staircase, people being pushed in the back by unseen hands and the heavy front doors slamming shut without warning! Let’s be honest – walking in the woods at night is pretty spooky at the best of times, but when those woods are also said to be one of the most haunted places in Hampshire, the creep factor goes up a few notches! 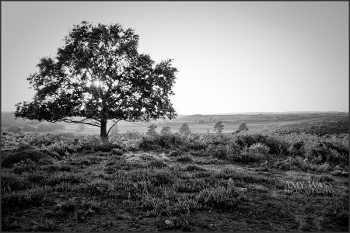 The New Forest has a long list of myths and legends associated with it including tales of smugglers, witches and even dragons. 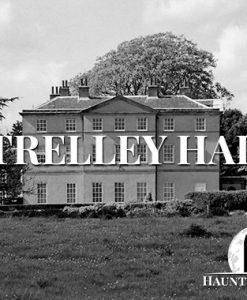 However, one spooky tale in particular seems to have some genuine paranormal activity attached – the tale of Sybil Leek aka the white witch of Burley. Sybil was often seen walking through the village dressed in her long black coat with her pet jackdaw sitting on her shoulder. However, despite the fact that she was a white witch, her appearance was more like the traditional ‘black’ or evil witch that people were so afraid of and the local people eventually ran her out of town. It is said that she moved to America, but that after her death she returned home to Burley and is seen walking the streets just as she did in life. Other ghostly goings on include the spirit of King William II who was killed in 1100AD at the Rufus Stone. Every year on the anniversary of his death he is said to rise again and walk to Winchester. A grim fate is said to befall anyone who dared to get in his way! There have also been stories of unexplained sounds of cartwheels and ghostly smugglers and highwaymen in the woods! Netley Abbey now stands in ruins, but it dates back to medieval period. It was initially built in 1239 and then closed by Henry VIII in 1536 during the Dissolution of the Monasteries. 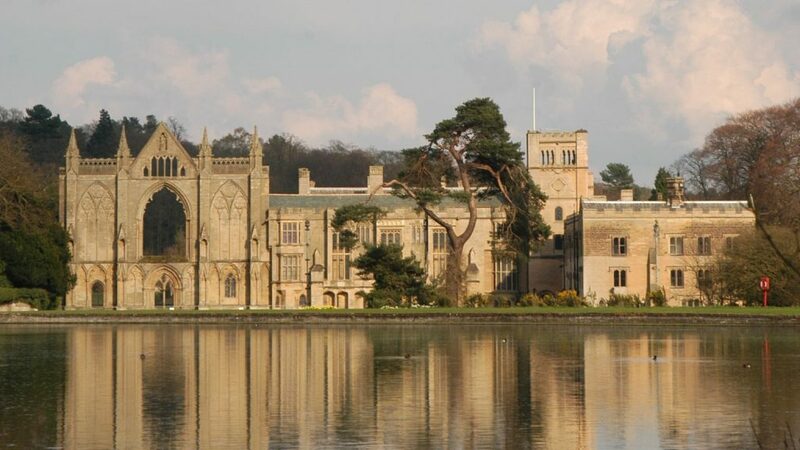 The abbey was then converted into a residence by Tudor politician William Paulet. It was abandoned in the 18th century and gradually went to ruin with much of the stonework being removed for building material. What is left of the abbey is now a scheduled ancient monument. 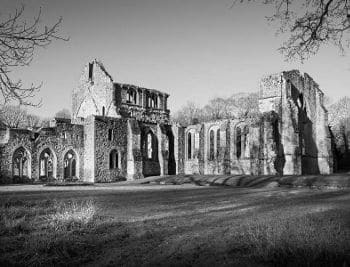 The abbey is allegedly haunted by two different spirits. The first is a ghostly monk who appears as a white figure and the other is a spectral abbot who is describes as a much darker figure. There is also a gruesome tale linked to the abbey involving a local builder named Walter Taylor who was commissioned to demolish the church. The night before demolition started, Taylor had a dream that an arch from one of the windows fell on him. Brushing it off as just another nightmare he started work on the demolishing only for one of the window arches, albeit not the one in his dream, to fall on his head fracturing his skull in the process. He died a short time later from the injuries. Some say that his restless spirit is also tied to the ruin. 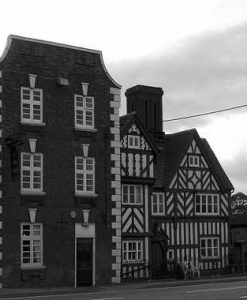 The Tudor House Museum was at one time a regular stop for local police because locals were constantly calling the police to report intruders after seeing lights on in the building and shadows passing by the windows. However, every single time the police arrived to investigate they found no intruders and no sign of a break in. The only thing they found was that the lights were on when they should not have been. Eventually, a medium was brought in to visit the house and she determined that the culprit was simply a spirit who was bored! She left a ball for the spirit and the following day the ball had vanished, but the lights now stay off! 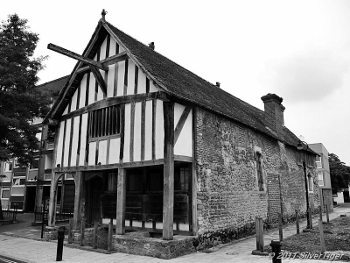 However, that was not the end of the paranormal activity at The Tudor House Museum which remains one of the most haunted places in Hampshire. During recent paranormal investigations, thermal imaging equipment has picked up a man sitting in a chair. Other visitors have also reported figures crossing rooms and walking through bricked up doorways. Hampshire ghosts were in the media not too long ago after one of the UK’s most haunted properties – Hampshire’s very own Wymering Manor failed to sell at auction! It is believed to be the oldest house in Portsmouth and is in desperate need of renovation. Most of the remaining structure is 16th century, but records show that the first owner of the manor was actually King Edward the Confessor in 1042, but it has been dramatically altered and renovated over the years. In the past it has served as a youth hostel , a family home, a monastery and a vicarage. It is allegedly so haunted that the security guards who patrol it 24/7 refuse to work alone – going everywhere in pairs. 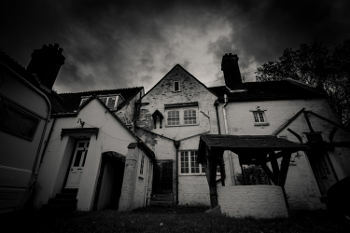 The manor has several different ghosts and paranormal occurrences associated with it all of which have contributed to the property’s reputation as one of Hampshire’s most haunted places. Among the most well known stories is the ‘lady in the violet dress’. Thomas Parr was living in the house when he encountered the lady in the violet dress standing by the foot of his bed when he woke one night. It was the spirit of a cousin of his who had passed away in 1917. She seemed friendly and as her name suggests, she was dressed in a violet dress. She chatted with Thomas for a short time before saying ‘Well, Tommy dear, I must leave you now as we are waiting to receive Aunt Em’. She then promptly disappeared and the following morning Thomas received a telegram informing him that his Aunt Em had died during the night. In addition to the lady in the violet dress, some of the other strange occurrences include a door in ‘The Blue Room’ which seems to unlock itself and stand open when nobody has touched it. 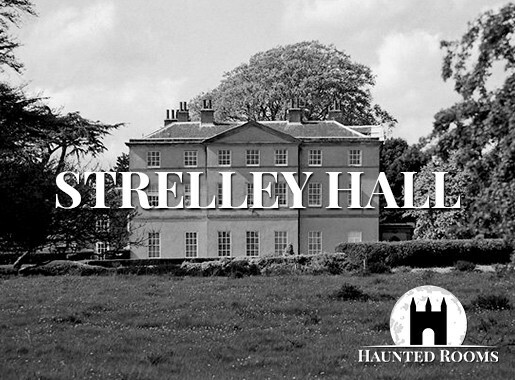 Visitors have also reported hearing the sound of a choir of nuns singing and chanting, the spectre of a nun on the stairs to the attic with her hands dripping in blood, a phantom horse that gallops down the lane outside and the ghost of distinguished Naval officer Sir Francis Austen. However, perhaps the most chilling room in the manor is the one known as ‘The Panelled Room’. Nobody enjoys spending much time in this particular room which has an oppressive air and leaves most people with the urge to run. 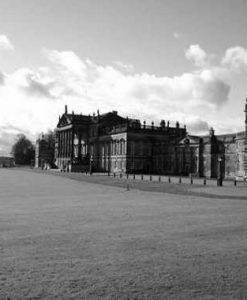 During the time that the building served as a youth hostel the warden and his wife were inexplicably afraid of the room and guests have reported feeling a hand on their shoulder!